Three consecutive minority parliaments from 2004 to 2011 renewed interest in the creation of a cabinet manual describing the unwritten rules, or constitutional conventions, that underpin Westminster parliamentarism. The United Kingdom just established its Draft Cabinet Manual in 2010, with a final version to follow soon, and New Zealand has long relied on its Cabinet Manual, now on its 8th edition as of 2008. In 2011, the Asper Centre for Constitutional Rights, the Public Policy Forum, and the Canadian Bar Association produced reports recommending that constitutional conventions be codified in a Canadian cabinet manual. They focused on conventions relating to the formation of governments, the governor general’s reserve powers (particularly on prorogation and dissolution), and the principle of restraint (as known as the caretaker convention). Most crucially, those calling for the creation of a “Canadian cabinet manual” have overlooked the existence of the Manual of Official Procedure of the Government of Canada, which the Privy Council Office produced under Prime Minister Lester B. Pearson in 1968. At the time of its production, no other Commonwealth country had ever produced a handbook on constitutional conventions of the Manual’s breadth and depth – a staggering 1,500 pages over two volumes. Sadly, as the Public Policy Forum pointed out in one of its reports, the Manual has since been “shrouded in secrecy and kept from all but a few senior officials.” It was likely kept in cabinet confidence until at least 1988 and never generated much interest, until the wake of our latest cycle of minority parliaments. My partner in parliamentarism Nick MacDonald and I first stumbled upon a reference to the Manual of Official Procedure of the Government of Canada in Michael Valpy’s article in the Globe and Mail from December 3, 2008, “Going Where No Governor General Has Gone Before” while we were researching for our first article “No Discretion: On Prorogation and the Governor General.” We finally uncovered this veritable constitutional treasure-trove after thorough research and patient application of ATIP requests with Library & Archives and months of waiting in total. But our persistence paid off marvellously! The Manual of Official Procedure of the Government of Canada and its Appendices are an exemplary officialization of constitutional conventions and must undoubtedly be considered in any effort to produce a new or updated Canadian cabinet manual on constitutional conventions. I hope that the Manual will help facilitate discussion of the key principles and core conventions of Westminster parliamentarism in Canada and give pause to those who called for the creation of a new Canadian cabinet manual from scratch. Nick MacDonald and I also wrote this short academic article on the Manual, which you can download from the link contained in the bibliographical citation below. A longer article comparing the Manual to its British, Australian, and New Zealand counter-parts will appear in the new year. MacDonald, Nicholas A. and James W.J. Bowden. 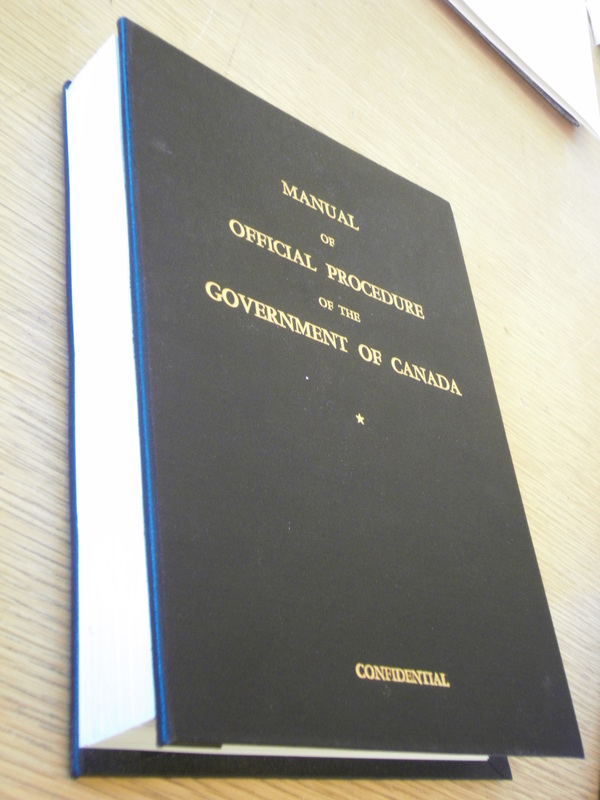 “The Manual of Official Procedure of the Government of Canada: An Expose“. Constitutional Forum constitutionnel 20, no. 1 (17 October 2011): 33-39. This entry was posted in Officialization of Convention. Bookmark the permalink. Any mention of a French edition? Yes, I found out about the status of the French edition after writing this post. The full explanation will appear in the long article (due in early 2012). Basically, PCO created the draft of a French version under Pearson, but after Trudeau took office, the French draft fell by the wayside and was never finalized.